Made from 100% Australian corn and rice this is a puffed snack with a strong cheese taste. Cheezels are great fun anytime, anywhere, just pop some on each of your fingers and have some finger-licious fun! Corn, Palm Oil (Palmolein, Sunflower), Rice, Milk Powder, Salt, Cheese Powder (1.0%), Corn Starch, Flavour Enhancers (E621, E635), Flavours, Vegetable Extract (Corn), Spice, Natural Colours (Paprika Extract, Carotene), Food Acid (E262), Onion Powder. 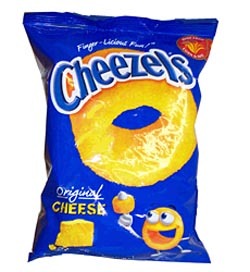 There is nothing quite like breaking open that bag and seeing all those gorgeous little cheesy hoops staring back at you, ready to be devoured!! Seriously addictive, great fun and an explosion of flavour like no other! Nothing comes close in the UK. CHEEZELS ROCK!! Cheezels give you the most fun you can have with a bag of chips. Light and crispy, full of the taste of cheese ... and I don't think anyone can resist putting at least one of these on their fingers!